India who has not accepted independence of Pakistan by hear in last half century has been given the status of most favorite nation. In order to provide basis for their heinous act our govt. is telling us that this is the first step to fulfill the dreams of Quaid-e-Azam Muhammad Ali Jinnah and Nawab Liaqat Ali Khan. What a disgusting argument? In contrast to this if our govt. had said that this is the first step to fulfill the dream of Benazir Bhutto, this would have not only calmed her soul but contented elite class of Pakistan weighing less than 1% of our population. Because Benazir wanted more than that, she wanted to return Pakistan back to the slavery of Hindu, she wanted to have a common currency and to work under President of India, her urge was so much strong that she could not apprehend herself from expressing her vision in front of media. Than why we are accusing founders of Pakistan, for our own national crimes of pledging our markets to India? We are blaming those noble personalities who sacrificed their lives to get freedom for Muslims of India from extremist Hindus? This is another aspect that we lost our freedom to the elite class who earned wealth by bowing in front of English as their servants before partition and afterwards captured Pakistan as their agents in the name of public govt. other wise The Great Leader Muhammad Ali Jinnah had said in the clear words, “we neither trust English nor Hindus, we will keep struggling against both even if they unite”. Vision of Quaid was much clear about India, he not only condemned Indian claim over Kashmir but he took Indian claim as most powerful and biggest economy as insult. He gave central importance to Kashmir, why he said that Kashmir is Vein of Pakistan; this can be now realized after half century when India is in a position to create draught in Pakistan by stopping water of rivers passing through Kashmir. If still anyone has doubts about vision of Quaid he should consult the interview of Jinnah to a journalist of Switzerland on 11 March 1948, he said, “if India gets out of its superiority complex, takes Pakistan as equal and neighbor country and considers all the ground realities as they are to solve the disputes than friendly relations with India are possible”. Has India lost its superiority complex or all the basic disputes including Kashmir have been solved that we have bestowed India with Most Favorite Nation? Painful situation is that India has gone beyond its claim over Kashmir, it has completed Pakistan to convert our lands into barren lands, has created a network over international level with the help of Jewish media and started an unending propaganda war against Pakistan. Most recent example is the documentary “Secret Pakistan” being telecasted over BBC with the title of “Backlash Week” as a weekly series. The central point of this documentary is that Pakistan army and ISI created Taliban against. This is the biggest lie of the century. Along with bewtowing us with the lollipop of the Indian friendship in SAARC conference, Man Mohan Singh said that till Pakistan does not satisfy India about Mumbai attacks till than peace process could not complete. He conditioned his visit to Pakistan with effective crackdown against terrorists (this is a golden chance for Pakistan to conduct surgical strikes over terrorist camps in India, as her leader wants that). While our Hindu-Jewish media of Pakistan was telling us, that Man Mohan Singh has accepted invitation to visit Pakistan. But shame is over those of our Great Intellectuals who are preaching Pakistani nation that not only Kashmir dispute but all other disputes with India should be ignored just for friendship with her. These bastards are always worried to fulfill their duty for which they are paid by India and Jews; however, their hands cannot dare to write anything about mass graves in Indian Held Kashmir. Here I would like to briefly state the story of mass graves in Indian Held Kashmir which is not only heart crushing but also a blow to our shameless intellectuals who are not only supporting friendly relations with murderer of humanity i.e. India; but also shamelessly providing fake arguments. Mass Graves in Indian Held Kashmir were discovered when a 70 year old grave digger, “Ata’a Muhammad” told guests from Delhi on 1 July 2009 that he has helped Indian soldiers to bury hundreds of corpses. These guests included representatives of IPTHR and two journalists. Ata’a Muhammad told them that he has buried about 235 corpses and huge number of other persons like him had been helping Indian army. He took journalists and human rights activists on the spot where these corpses were buried. Organization for human rights “International Peoples Tribunal for Human Rights” started the digging of the graves and dug up many human skeletons within three months. On 7th October, 2009 Indian Convener for IPTHR, “Angna Chatarjee” disclosed in a press conference that her organization has dug up more than twenty sic hundred corpses in last few weeks. Although India succeeded in suppressing this news which was very heart crushing but it was impossible for India to stop internet from publishing the reality. This forced India to establish an investigation commission. This commission took forward the discovery of mass graves in the jungles of Kashmir along with representatives of IPTHR. Possibly commission might have not investigated further but on the pressure of Human Rights Organizations in August 2011, in which it was stated that Indian govt. had buried 2730 corpses in the mass graves. These people were terrorists. 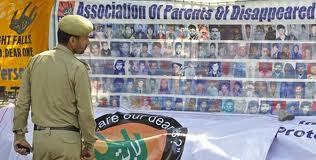 However 574 were identified as citizens of Indian Held Kashmir while rest were terrorists from Pakistan. It was also stated in the report that no one was ready to receive dead bodies so they were buried in mass graves. This report was rejected by IPTHR as fraudulent. In a press conference the organization revealed that massacre, burial in mass graves has been going since 1997, and the numbers of corpses buried in such mass graves are more than fifty thousand. They further disclosed that since September 2009 to August 2011 they have discovered more than 2000 mass graves in Indian Held Kashmir. But the organization does not have the resources to dig up the human remains and preserve them. Representatives of organization also condemned criminal negligence of international media and Western countries over massacre of Kashmiri people in Indian Held Kashmir. Angna Chattarjee is of the view that at this time the biggest problem is to conduct the DNA tests over these human remains, so that the corpses can be identified and handed over to their families who have been buried in sorrow alive waiting for their loved ones. She also revealed that examination of these dug up skeletons and corpses shows that they were shot dead in the head from zero distance. Such heinous discovery of mass graves in Indian Held Kashmir should have jolted the so-called civilized world, because there is no such example in the world of such genocide. In the Palestine, Palestinians are denied of all basic rights to live but even in Israel no such graves have been discovered (or human rights organizations does not have any access). Here one point is very important that thousands of organizations over the globe are active for support of Palestinians. One can find hundreds of pictures, articles, news reports on internet websites about human rights violations and in support of Palestine. People from all over the globe are supporting freedom of Palestine. Most of the people come from USA. Alas! No such support for the protection of innocent Kashmiri people is observed anywhere. They have along history for struggle and sacrifices of freedom but biased media is not ready to give any coverage to these people. Because this media and their countries have interests in economy of India. 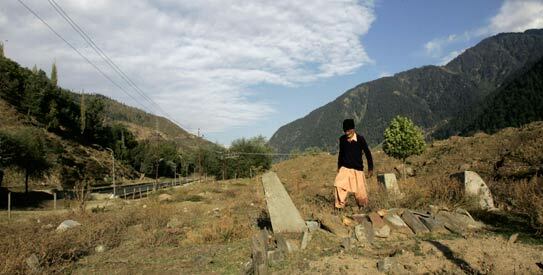 Amnesty International declared discovery of such a huge number of mass graves as moral defeat of India. Indian citizen living in USA and working as higher official of Amnesty International for South Asia, protested against Indian war crimes in Indian Held Kashmir, “as India has succeeded in securing a special position on the international level so there are no hopes that international community will be able to pressurize India to stop state terrorism in Indian Held Kashmir. But this does not mean that we should also keep silent. 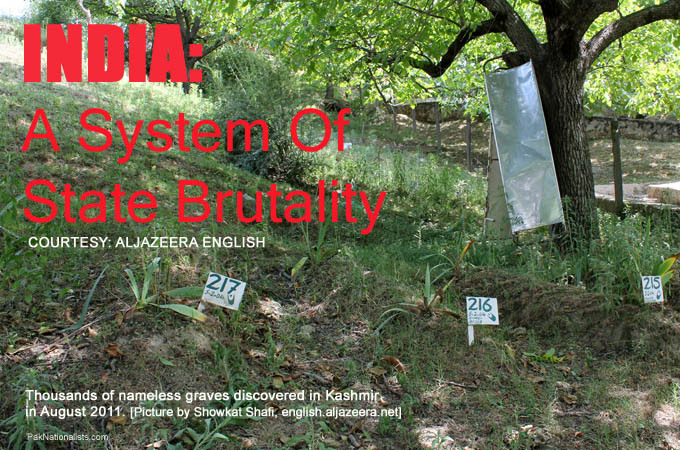 This is the duty of all of the Human Rights Organizations to educate their people about state terrorism in Held Kashmir so that international community takes steps to hold an international investigation in mass graves”. He further said that Indian response to such discoveries of mass graves is inhuman and much disgusting. The reason behind this is criminal silence of international powers which has encouraged Indian state terrorists involved in genocide of Kashmiri people. All these things at its place, but here the problem is of the completion of Pakistan which is conditioned with the freedom of Kashmir. Alas! Our corrupt leaders had sense to understand the feelings of Kashmiri people living in Indian Held Kashmir, even these innocents have been forced to say, “Forget about us, we were fighting our war for freedom alone and will continue to do that, you just try to take care of freedom of Pakistan”. This is reality; when we listen to the shameless arguments in talk shows in the favor of India, they have just one message to encourage India for more state terrorism and human rights violations in hidden words. They are just beating the same triumphant that friendly relations with India will result in improved trade with India, and this will have positive effect over Pakistani economy. But the ground realities are different from this. All the benefit of this trade is in favor of India. For example look at the data of trade from 1 July 2010 to 30 June 2011, in this time period of one year 31897 trucks carrying Indian goods of 20 billion entered into Pakistan, while in contrast to this only 4664 trucks were allowed to enter into India carrying Pakistani goods. This is an example of the trade which took place in between India and Pakistan in official papers, how much goods were smuggled into Pakistan in the name of Afghanistan or through other means this is exception to this data. Here in Pakistan we do not have Natural Gas, no electricity, fuel is so much costly, our agriculture has been deprived of water by India, here we buy a bag fertilizer for 1800 while in India it s only for 400, so in such grave situation how our economy will be able to compete Indian goods? Mass Graves in South Dakota, USA. 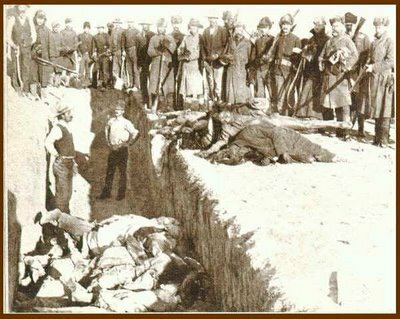 In the end, I would like to share that from where the history of mass graves started; on 29 September 1890, thousands of Red Indians were murdered and buried into mass graves in South Dakota, USA.